Welcome - Glasses, food and LGBTQ raised $20,865 on HandUp! This campaign is to support Welcome Ministries various programs for homeless and low income individuals. Funds raised in this campaign will go directly to providing free prescription eye-glasses to homeless and low income San Franciscans and Hawaiians, facilitate mission trips for youth and college students, support our homeless choir and community garden projects and enable us to survey and advocate for the needs of LGBTQ homeless individuals in San Francisco. 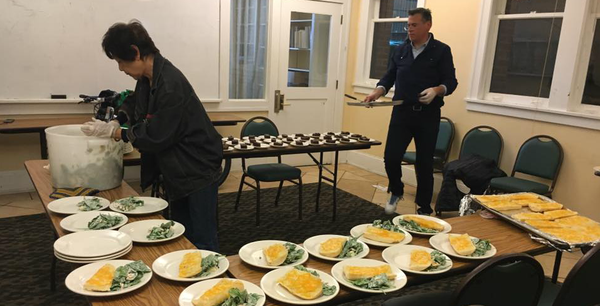 Welcome, an innovative nonprofit located in San Francisco, began in 1996 as a drop-in meal program in the Polk-Gultch district. Over the years, our programming shifts to find a faithful way to respond to the most current needs of the homeless in San Francisco. Our programs primarily support LGBTQ individuals of all ages and are designed to patch the holes in the system of care. In the past our services have included a homeless identification project, community gardens that produced over 5 tons of produce, supporting and reviving vital programs that would otherwise be closed and giving a voice to homeless LGBTQ youth. Welcome also facilitates the Singers of the Streets choir program, and hosts vision events to provide free prescription eye glasses to homeless and/or low-income San Franciscans. On November 19th we will be celebrating the 10 year anniversary of Pastor Megan Rohrer, our Executive Director and the first openly transgender pastor ordained in the Lutheran church. Pastor Megan is listed in the Trans100, received an honorable mention as an Unsung Hero of Compassion with His Holiness the Dali Lama, was presented a medal of tolerance by the King of Tallo in Indonesia, won OutHistory's Since Stonewall Local History competition and was a finalist in transgender non-fiction for the Lambda Literary Award. Purchase a ticket or sponsor the event by selecting an 'Event' option from one of the Giving Levels! If you are gifting to attend the event, as you check out you must keep the box checked that says: “Keep me updated on campaign news from SF Cares“ so that we have your email address and can send you important event details. A beautiful story and video about one of Welcome's projects, the Singer's of the Street. Read the full story here Our homeless choir rehearses every Monday and we will have a CD Release concert on November 5th at St. Paulus Lutheran Church from 3-5pm. In addition to the healing quality of music, our choir also provides lunch, teaches cooperation, listening and other basic life skills, and serves as a weekly pep rally for individuals who are working on improving their life circumstances. Our work is a string of hope, in the deep dark loneliness that is homelessness. Your support of our campaign will help Welcome not only support the Singers of the Street, but to continue creating additional programming to support the homeless and hungry around San Francisco. A $20 donation covers one pair of prescription eye glasses - give the gift of clear eye site! A $250 gift gets you a homemade stole made by Pastor Megan for the pastor of your choice. You pick the color! You'll start to receive updates in your email on Welcome - Glasses, food and LGBTQ 's progress.